ACEO stands for Art Card Editions and Originals and are an affordable way to collect art. Original gouache abstract painting, "Abstract #9," by Artist Jane Mortimore.Painted on Strathmore 140 lb cold press watercolor paper. 100% Handmade Persian Miniature Painting by an Art Student from Tehran University with Gouache and Watercolor on Macet Paper. Joel M Roman "F.B.H. 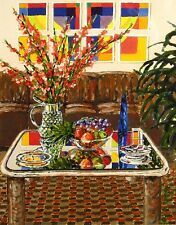 Still Life" Original Gouache Painting flowers Make Offer! Original Gouache painting by Joel M. Roman. Original Gouache Painting on Watercolor Paper. Joel Roman. See picture above. Accademia dei Belli Arte, Bologna, Italy, studying painting and drawing under Ilario Rossi. Marilyn "Nan" Fiegl (1927 – 2017). She was born May 29, 1927, in Canandaigua, a daughter of the late Harry and Mildred Burke Andrews. On Aug. 29, 1958, she married Lawrence E. Fiegl, who predeceased her on March 31, 1984. This is a signed Lithograph. This is a very rare item as there are not many left around, and.